Former Staff Sgt. Clint Romesha didn't really want to write a book. But the Medal of Honor recipient, recognized for his actions during the ferocious and deadly 2009 battle at Combat Outpost Keating, realized he had been given a chance to honor his fellow soldiers as well as the eight men who gave their lives that day. "I went back and forth for a while, and I told the families and the guys from Red Platoon, 'If I do it, you guys are going to have to be involved,' and they agreed to that," Romesha said. "So it wouldn't just be a story about Clint Romesha, but their story, the eight guys who never made it home and the 52 others who were there that day." 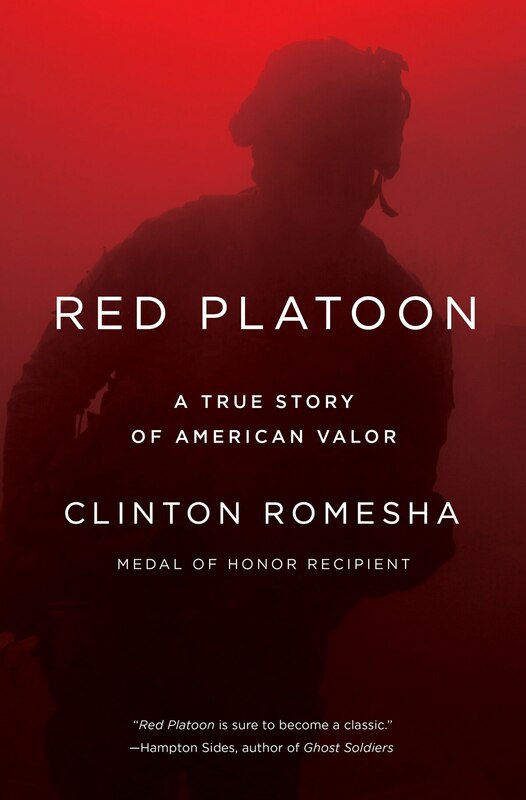 "Red Platoon: A True Story of American Valor" is scheduled for release on May 3. To write the book, Romesha interviewed his fellow soldiers, the families of the fallen, and the aviators who provided close-air support to the soldiers on the ground. He also had to work through having to relive, in painstaking, vivid detail, the ferocious battle. "I knew we were going to be dabbling in some emotional stuff that's pretty intimate, and then to share it with the world," Romesha said. "But talking to some of these guys, every interview we got done with, you walked away with a sense of pride and just a sense of feeling good about what we did accomplish. Even though there was so much loss and tragedy there, it was more about rising up when things were looking so bleak and abysmal. We really came together and came through." 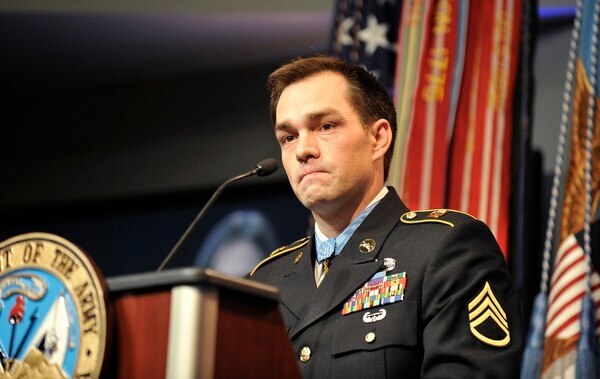 Romesha, 34, received the Medal of Honor during a ceremony Feb. 11, 2013, at the White House. At the time, he was the fourth living service member to receive the nation's highest award for valor for actions in Afghanistan or Iraq. Former Army Staff Sgt. Clinton Romesha delivers remarks during a ceremony in his honor Feb. 12, 2013, at the Pentagon in Arlington, Va.
Romesha was a section leader in B Troop, 3rd Squadron, 61st Cavalry Regiment, 4th Brigade Combat Team, 4th Infantry Division during the Oct. 3, 2009, attack on COP Keating in eastern Afghanistan. Eight American soldiers were killed and two dozen others wounded as the troop-sized element fought against an overwhelming enemy force that launched a brazen attack to overrun the COP. The attack on COP Keating remains one of the deadliest attacks against coalition forces in Afghanistan and was chronicled in the book "The Outpost" by Jake Tapper. Former Staff Sgt. Ty Carter, who also fought at COP Keating, also received the Medal of Honor for his actions during the battle. At least nine other soldiers from the troop received the Silver Star, the nation's third highest award for valor. Romesha, who enlisted in the Army in September 1999 as an M1 armor crewman and deployed to Kosovo and twice to Iraq before serving in Afghanistan, left the Army in 2011. He lives in Minot, North Dakota, where he moved to work in the oil field construction business. Former Army Staff Sgt. 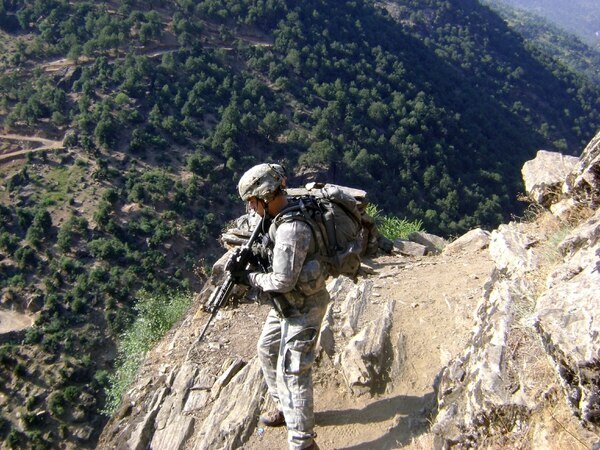 Clinton Romesha on duty in Afghanistan in an undated photo. As he began to write the book, Romesha said he wanted it to extend beyond the Oct. 3, 2009, battle. "I also wanted to concentrate on the platoon beforehand," he said. "This was a unit of your average combat platoon that was faced with a pretty epic event." Romesha said he didn't know how the writing process was going to go, but he felt reassured knowing that his battle buddies were on board with the project. "One of the crucial things to doing this is we would fly to wherever [the guys] were to sit down and have a face-to-face conversation," he said. "For a lot of veterans, it's easier to open up to another one, and even more so someone who's been there." Romesha also spoke with some of the Gold Star families. "They were all offered to be involved as much or as little as possible," he said. "Some were more willing to give their thoughts and opinions, some were a little more guarded." As he conducted the interviews, it was "kind of like a mini reunion," Romesha said. "It's always great, it's a good part of the healing process," he said. "There's a tomorrow if we show up to it." Romesha said he hopes readers of his book will get a chance to learn about his platoon mates and the men he served alongside. "A lot of times we live in this world where everyone thinks you're 10 feet tall and bulletproof, but we all came from all walks of life," he said. "It's that team you have to build as a unit, it's that heart you've got to have. Sometimes things do look bad, and you're faced with some pretty big odds stacked against you, but coming together, trusting each other, you can do a lot." 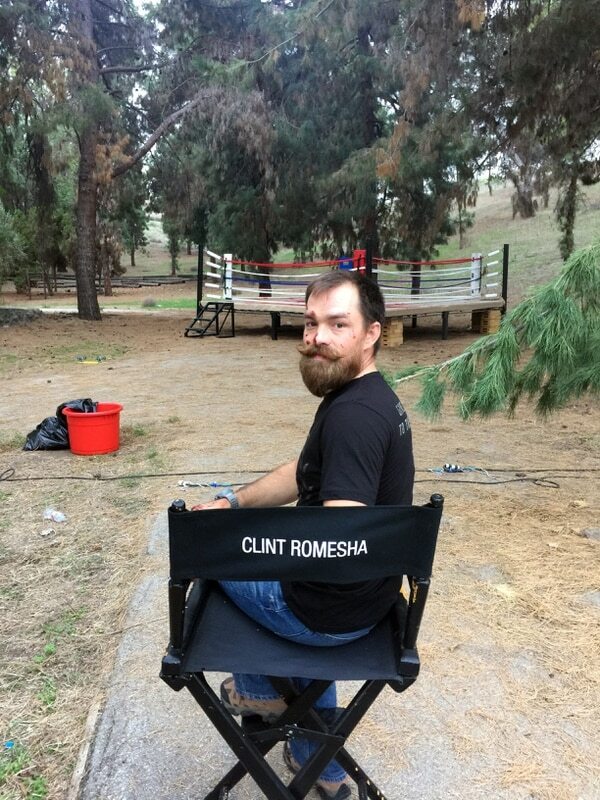 Clint Romesha on the set of "Range 15"
In addition to writing his book, Romesha also is appearing in the upcoming "Range 15," a feature-length zombie action-comedy produced by veterans. He got roped into the movie by fellow Medal of Honor recipient Leroy Petry, Romesha said. "You have a bunch of veterans coming together to make a movie that veterans can enjoy, a have fun, feel-good thing," Romesha said. After he signed on, Romesha and Petry spent about a week in Los Angeles to film their parts, Romesha said. "We spent a day hanging out, visiting with all the veterans there, seeing the creative process unfold," he said. "It made me a lot more comfortable, because being on film is a little nerve-wracking. My acting skills only go back to playing soccer in high school." The movie-making experience was "an absolute blast," mostly because of the other veterans on set, he said. "It was great to be there with all sorts of veterans from every branch of service and every different path in life they'd taken and to see and listen to their stories," Romesha said. "It was great to be part of it." As he prepares for the release of his book, Romesha said he hopes to give credit to the men who fought alongside him and the eight men who died at COP Keating. "We can never forget," he said. "Those guys aren't truly gone until we've forgotten them, so we have to remember them. That's how we'll continue to progress forward and heal."